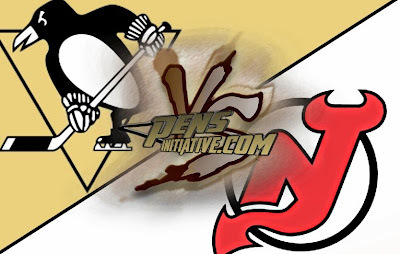 Last night in New Jersey Marty Brodeur and the Devils defeated the Penguins by a score of 4-1. Marty B looked incredible. 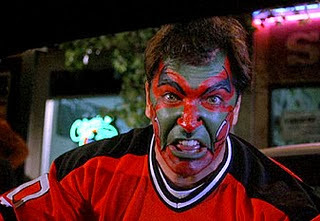 You might not have noticed that he is the Devils back up goalie. At times I wished that they had Corey Schneider in net instead but clearly that might not have solved the problem. Loses are never easy, especially when they come from this fan base.. Okay, that is a stretch but I needed to find a way to slip this in..
Don't be shocked when you read this, I know it will be shocking (looks for sarcastic font) byt the Penguins for the most part dominated the majority of the first period, I know it sounds CRAZY! We out shot the Devils 10-3 and outside a tripping call to James Neal we managed to stay out of the box. The Devils would be able to get on the score board first with 19 seconds left in the period when Andy Greene took a wrist shot that trickled through Fleury to put the Devils up 1-0. The Penguins did not wait long into the second period to tie the game up when Chris Kunitz would rush put his breakaway attempt past Marty B who failed on the poke check. It was Kunitz's 9th goal on the season. Oh, Flower did do this. at 18:43 the Devils would put the final nail in the coffin when Jagr would put in his second of the night into an empty net to make it 4-1. And that would be the final goal of the game. Our next game is Monday against the Anaheim Ducks at 7:30 in Pittsburgh. The Penguins were 0 for 4 on the power play. We managed to only give the puck away 5 times. Not good but not our worst effort. And only 1 was Letangs fault.